While engine oil might not be the first place fleets look to cut fuel costs, Shell made its case that many heavy-duty operations are leaving significant savings on the table. In the United States, even transitioning from a standard 15W-40 oil to a 10W-30 grade can unlock greater fuel economy, the company said. 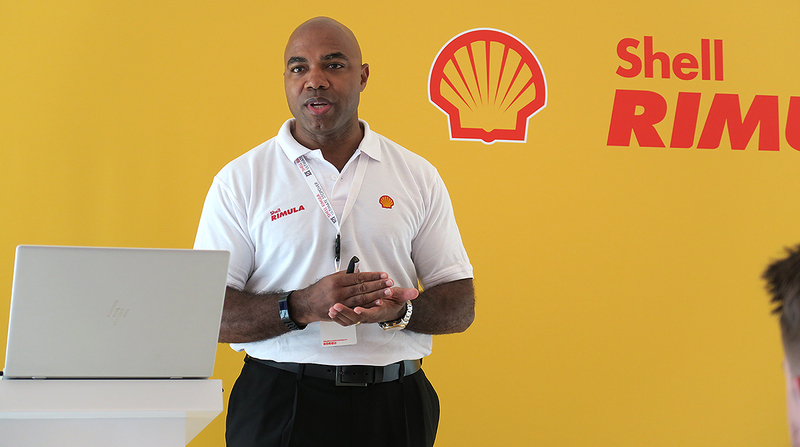 “There is still so much to gain by convincing customers to move to lower viscosity lubricants,” said Jason Brown, global technology manager for diesel engine oils at Shell. To validate its argument that lubricant selection can have an important effect on fuel efficiency, Shell conducted extensive testing of eight of its engine oils in 18 different diesel engines across three major markets — the United States, Germany and China. The company revealed the results of this global fuel-economy program here Nov. 16 at the Shell Rimula Ultimate Stopover event for global customers and trade press. In the United States, Shell tested various engine oils in six different trucks meeting 2010 emission standards that were equipped with diesel engines from Cummins, Detroit, Paccar, Navistar, Mack and Ford. The fuel-economy field trials, conducted at a test site in Texas, were designed to mirror real-world highway and urban driving conditions, Brown said. After 24 days of testing, including two tests on each truck-oil combination, Shell’s 10W-30 CK-4 engine oil demonstrated a 2.3% average fuel-economy benefit compared with its standard 15W-40 oil and a 1.4% gain compared with a 10W-40 grade. Meanwhile, Shell’s 10W-30 FA-4 oil showed a 2.6% fuel-efficiency improvement compared with the 15W-40 and a gain of more than 1.7% from the 10W-40. A prototype 0W-20 oil showed even stronger fuel-economy benefits: a gain of more than 3.7% versus the 15W-40 and a nearly 2.9% gain from the 10W-40. Although that 0W-20 grade won’t be viable until manufacturers begin designing their engines for such a low-viscosity oil, it does illustrate that significant opportunities remain to enhance the efficiency of lubricant, Brown said. However, the push to boost fuel efficiency must be tempered by the need to maintain engine protection in a range of applications and operating conditions, from heavy mining to high altitudes and extreme heat. Shell said its fuel-efficiency tests in the United States and around the globe have given it more specific data to share with fleet customers and will allow the company to collaborate more closely with engine makers on future development. Shell executives also reflected on the North American market’s recent transition to the American Petroleum Institute’s CK-4 and FA-4 engine oil categories, which became industry standards in December 2016. Chris Guerrero, global brand director for Shell Diesel Engine Oils, cited a “huge level of adoption” for CK-4, which replaced the CJ-4 category. “Largely, it is a CK-4 market in North America,” he said. However, adoption has been much slower for FA-4, which is designed specifically for newer engines and has limited backward compatibility. One barrier has been fleets’ preference to minimize complexity in their maintenance shops by carrying one engine oil instead of two, Guerrero said. Nonetheless, the longer term trend is moving toward higher efficiency, he said, and Shell’s work on FA-4 also will prepare the company for changes in other parts of the world. Shell markets its engine oils under the Shell Rotella brand in North America, while Shell Rimula is the company’s primary brand in much of the rest of the world. While 15W-40 remains the dominant engine oil viscosity in the North American market, there is a growing acceptance of lighter grades, said Dan Arcy, Shell’s global OEM technical manager and industry trade association liaison. Truck manufacturers are now factory-filling their vehicles with 10W-30 oils, he said. Looking further into the future, the industry may very well move to 0W-20 lubricants in heavy-duty diesels.